NASA's Cassini spacecraft captured this view of the north pole of Saturn's icy moon Enceladus during a flyby on Oct. 14, 2015. NASA's Cassini spacecraft photographed this cratered terrain near the north pole of Saturn's icy moon Enceladus during a close flyby on Oct. 14, 2015. Thin fractures slice through the craters — part of a network of similar cracks that wrap around the satellite. 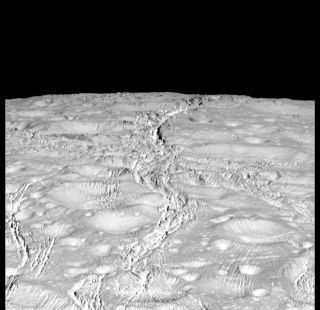 "The northern regions are crisscrossed by a spidery network of gossamer-thin cracks that slice through the craters," Cassini imaging team member Paul Helfenstein, of Cornell University in Ithaca, New York, said in a statement. "These thin cracks are ubiquitous on Enceladus, and now we see that they extend across the northern terrains as well." Cassini spotted powerful water-ice geysers near Enceladus' south pole in 2005. These jets are blasting into space material from the ocean of liquid water that sloshes beneath Enceladus' ice shell, scientists say. Mission scientists will scan the new flyby images for signs of activity coming from the north polar region as well, NASA officials said. Wednesday's flyby serves as a prelude to another upcoming close encounter: On Oct. 28, Cassini will cruise within just 30 miles (49 km) of Enceladus' south polar region, NASA officials said. "During the encounter, Cassini will make its deepest-ever dive through the moon's plume of icy spray, sampling the chemistry of the extraterrestrial ocean beneath the ice," agency officials wrote in the same statement. "Mission scientists are hopeful data from that flyby will provide evidence of how much hydrothermal activity is occurring in the moon's ocean, along with more detailed insights about the ocean's chemistry —both of which relate to the potential habitability of Enceladus," they added. This image, captured on Oct. 14, 2015 by NASA's Cassini spacecraft, shows heavily cratered terrain around the north pole of Saturn's icy moon Enceladus. Those two future flybys will be Cassini's last close encounters with the 314-mile-wide (505 km) Enceladus. Cassini will end its $3.2 billion mission — which is a collaboration involving NASA, the European Space Agency and the Italian Space Agency — with an intentional death dive into Saturn's thick atmosphere in September 2017.